I love how this show manages to keep everything flowing at a fairly natural pace, all while maintaining an excellent sense of character development and progression. Everything just fits together so well, which is why I like how Steins;Gate has been going so far. Anyways, the huge event that’s needed to revive Mayuri and cross the 1% divergence line is an interesting matter. I just wonder what it could be. Yeah, I’m glad they clarified some of the concepts, such as the 1% boundary, and those numbers, and, to some extent John Titor. Yes. Every episode has worked for me. Absolutely every episode. I kept feeling that the story was deepening — although slower at first than recent episodes for sure! Okabe and Kurisu have a great chemistry. They work so well, apart, but especially together. 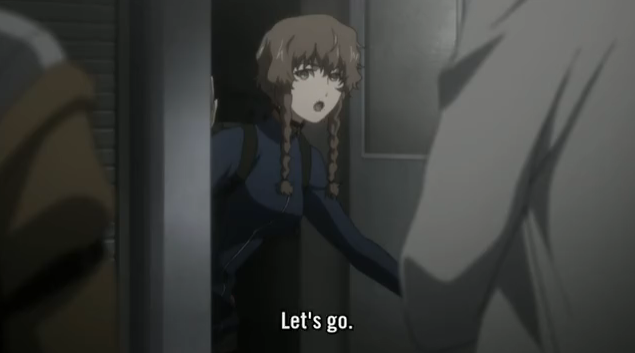 Personally, I wouldn’t have liked Suzuha’s explanation – it would feel too much of a plot dump – but somehow, Steins;Gate’s setting, her using the rope as a metaphor while actually using the rope, and the whole mysteriousness of it all made this plot dump feel perfectly natural. Madoka is not the best show of this year. This is an excellent show. I think they have done an incredible job at slowly easing us from a world completely familiar to us from our own experiences to a world that is still familiar, although the rules have changed from what we can experience walking down the street. It feels very believable, and now we understand the personalities of the characters, so we just need to see them, or hear a few words to get a sense of what they are thinking. Oh yes, that’s another good point – Steins;Gate’s setting isn’t ‘abnormal’, unlike settings of other shows (e.g. fantasy land, outer space, and even slice-of-life classroom-shows’ settings are ‘abnormal’, since they’re so hard to relate with). Akiba isn’t portrayed as the bright, vibrant place that everybody wants to go to – there’s that dimly lit ramen shop, there’s Mr. Braun’s shaggy apartment, and even when they are on the main streets the lighting makes it seem uncomfortably hot, perhaps more like the real Akiba. Blah blah blah Steins;Gate is amazing, using a setting easily taken from the real world to make such a captivating story. Well said. Aside from the extraordinarily high number of attractive girls, the world Okabe lives in is surprisingly ordinary — until he manages to gradually unravel the fabric of reality with his experiments.